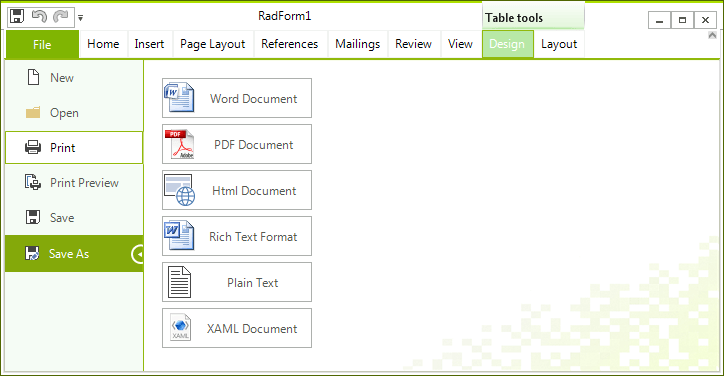 RadRichTextEditor allows printing the RadDocument instance shown in it. The following article describes the available printing modes, as well as how to use the respective for the feature API. In order to take advantage of the printing functionality, the document you want to be printed has to be shown in a RadRichTextEditor. In cases when you do not wish to actually show the editor to the user you can set the height of the control to 0. RadRichTextEditor's predefined UI – RibbonUI, allows you to directly Print by pressing the backstage item of the ribbon. Additionally to using the UI, you can print by taking advantage of the Print(), Print(bool showPrinterSettings) and Print(bool showPrinterSettings, RadPrintDocument document) methods of RadRichTextEditor. In addition RadRichTextEditor also provides a PrintPreview() and PrintPreview(RadPrintDocument document) methods. If you want to specify any print setting you can create an instance of RadPrintDocument and pass it to the respective method override.